And now, A little update/announcement I would like to make to keep you posted with what's going on recently! 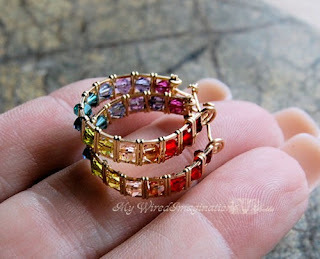 If you follow Bobbi's (from myWiredImaginations) works, in August 2010, Bobbi published her new design, Nose Rings aka Honey I Shrunk the Bracelets and had been having alot of attention from the community. Friends in forum started to shows interests and told Bobbi that they really liked how tiny these hoops were getting, and it put the thought in her head, that maybe they would work as nose rings too. Then two months later, i.e. October 2010, Bobbi wrote a tutorial for this design. These wonderful hoop earrings evolved from Bobbi's Swarovski Crystal Bracelet design. They can be made as big or as tiny as you like – She’d “shrunk” them down small enough for a nose ring and of course they started as a bracelet. This is a high-level beginner to intermediate project. The project is not complicated, but does assume you are familiar with; basic wire handling skills, such as cleaning, straightening wire, turning a basic loop, and completing a basic binding wrap. Check out this tutorial soon so that you can make them in time for Christmas!